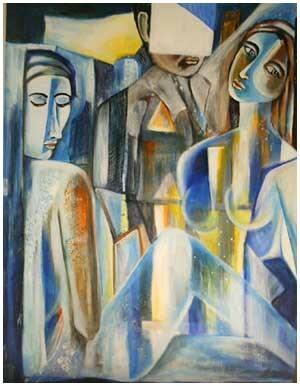 Shan Re is one of the most versatile artists in India having explored a wide array of subjects and genres such as abstract expressionism, minimalism, figuration and geometric abstraction in several group and solo exhibitions in Bangalore, New York, Philadelphia and San Francisco since the year 2000. 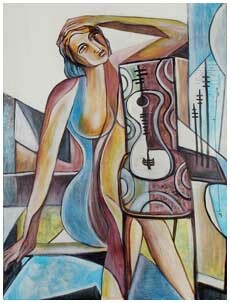 Shan’s strength lies in her ability to invoke human sentiment with minimal detailing, flowing colors and simple forms. In her figurative work, she often captures her subjects in a moment of contemplation, self-discovery or self-healing. Her abstract works are exuberant and compelling - the boldness and harmony of lines and colors imply a sense of joie de vivre, a celebration of life. Her Free Association Drawings triumphantly capture Shan’s spirit and essence. Through the process of Free Association Shan is able to tap into the energy within her soul to create these simple yet powerful drawings that often invoke within the viewer those elusive feelings of rapture, hope and even tranquility. Shan Re's work is in important private and corporate collections in India, United States and Europe. She currently lives and works in Bangalore. She is always possessed by the idea of creativity and reinvents herself constantly. Shan Ré has spent most of her career on a bohemian journey traversing India and United States. She currently lives and works in Bangalore, India. Besides painting and drawing Shan has worked on varied art projects such as mixed-media murals, stainless steel sculpture, and functional sculpture. Over the past two years she has been commissioned by several corporations in Bangalore to produce large-scale murals and sculptures. Brigade Tech Park, Bangalore - Woodrose Club, Bangalore - ITC Infotech, Bangalore - RMZ EcoSpace, Bangalore - Embassy Golf Links Business Park, Bangalore - Biocon India Ltd., Bangalore - Personal Collection of Rohini Nilekani, Bangalore - Bhoruka Power Corporation, Bangalore - ING Vysya Bank, Bangalore - Salarpuria Hallmark, Bangalore - Prestige Constructions, Bangalore - Sankars, the book people, Bangalore - Personal collection of - Society for Psychical Research, London - Personal Collection of Jackie Collins, L.A. - American Zoetrope Ltd., San Francisco - Personal Collection of Mari Plooij, Amsterdam - Personal Collection of Petra Werner, Berlin - Rubicon Estate, Napa Valley - Blancaneux Lodge, Belize & in other private collections across the world.